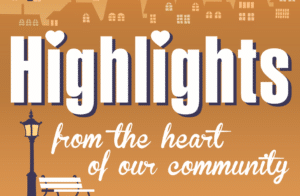 The show airing April 2, 2018 – April 9, 2018 ‘highlights’ the YWCA’s Annual Style Show & the Kanawha County Library’s Annual A Tisket A Tasket A Literary Basket event. We interviewed Cathryn Harris, Committee Member with the YWCA Style Show. 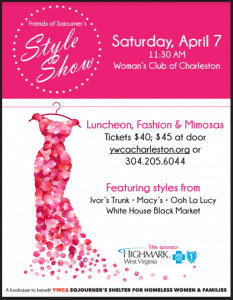 This year’s show is set for April 7, 2018 beginning at 11:30 a.m. at the Women’s Club of Charleston on Virginia Street. The event not only includes a wonderful lunch and beautiful apparel, but over 50 silent auction items to bid on. All proceeds support the YW’s Sojourner’s Shelter in Charleston. Special thanks to Amanda Barren of WSAZ for hosting and Super Duper Charlie Cooper for providing the music. The 4 retailers providing spring attire include: Ivor’s Trunk, White House Black Market, Oh La Lucy and Macy’s. Call 304-205-6044 to secure tickets. They may also be purchased at the door or online at here. 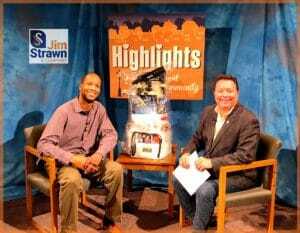 We also talked with Stuart Frazier, Marketing Coordinator for Kanawha County Library. He discussed their upcoming 12th Annual A Tisket A Tasket A Literary Basket Event set for April 28th beginning at 6:00 p.m. at the Temple Israel on the Kanawha Blvd East. 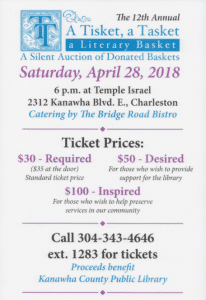 The Friends of The Library will host “A Tisket, A Tasket, A Literary Basket” silent auction as a fundraiser for the Kanawha County Public Library. Nearly 100 baskets for all ages are themed around a book, DVD, CD, or other library item and available to bid on during the event. They make an excellent gift for family and friends or an incredible addition to the household. The Basket Auction will be held at Bnai Israel Temple, 2312 Kanawha Blvd. East, Charleston, WV 25311 on Saturday, April 28, 2018 starting at 6 p.m.! Last year the Basket Auction raised more than $39,000 for the library and helped support the 3,000 FREE programs held in 2016-2017. Tickets for the event are $30 in advance, and $35 at the door. If you wish to contribute more to the library, you may purchase tickets at $50 or $100! To purchase tickets, contact Lois Payne at lois.payne@kanawhalibrary.org or (304) 343-4646 ext. 1283.